Ozerov A.Yu. 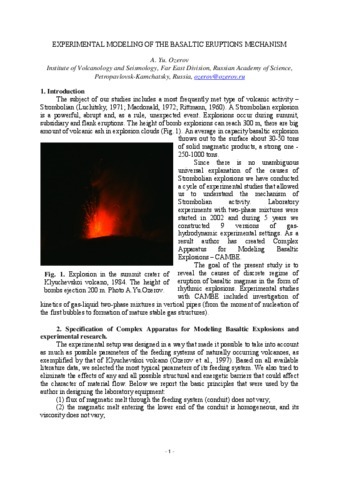 Experimental modeling of periodicities in the dynamics of lava fountaining // 7th Biennual workshop on Japan-Kamchatka-Alaska subduction processes: mitigating risk through international volcano, earthquake, and tsunami science (JKASP-2011). Petropavlovsk-Kamchatsky, Russia. August 25-30, 2011. 2011. P. 34-35. Ozerov A.Yu. 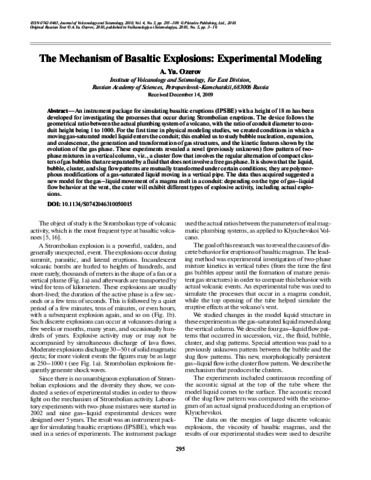 Experimental modeling of the basaltic eruptions mechanism // International Conference Fluxes and Structures in Fluids: Physics of Geospheres – 2009, Selected Papers. 2010. P. 269-278. An instrument package for simulating basaltic eruptions (IPSBE) with a height of 18 m has been developed for investigating the processes that occur during Strombolian eruptions. The device follows the geometrical ratio between the actual plumbing system of a volcano, with the ratio of conduit diameter to conduit height being 1 to 1000. For the first time in physical modeling studies, we created conditions in which a moving gassaturated model liquid enters the conduit; this enabled us to study bubble nucleation, expansion, and coalescence, the generation and transformation of gas structures, and the kinetic features shown by the evolution of the gas phase. These experiments revealed a novel (previously unknown) flow pattern of two phase mixtures in a vertical column, viz., a cluster flow that involves the regular alternation of compact clusters of gas bubbles that are separated by a fluid that does not involve a free gas phase. It is shown that the liquid, bubble, cluster, and slug flow patterns are mutually transformed under certain conditions; they are polymorphous modifications of a gassaturated liquid moving in a vertical pipe. The data thus acquired suggested a new model for the gas–liquid movement of a magma melt in a conduit: depending on the type of gas–liquid flow behavior at the vent, the crater will exhibit different types of explosive activity, including actual explosions. 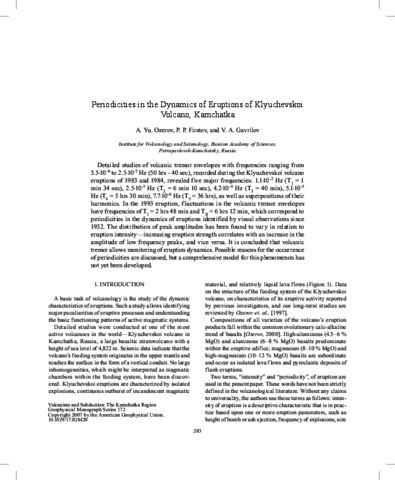 Ozerov A.Yu., Ariskin A.A., Barmina G.S. 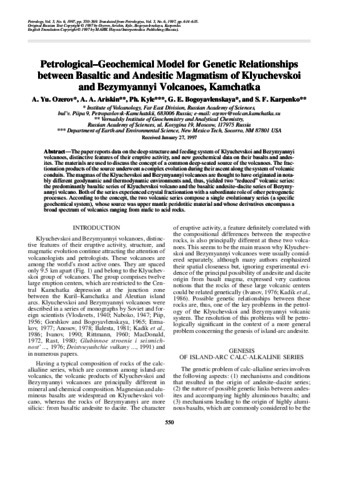 The Problem of Genetic Relations between High-Aluminous and High-Magnesian Basalts of the Klyuchevskoi Volcano, Kamchatka // Transactions (Doklady) of the Russian Academy of Sciences / Earth Science Sections. 1996. V. 350. № 7. 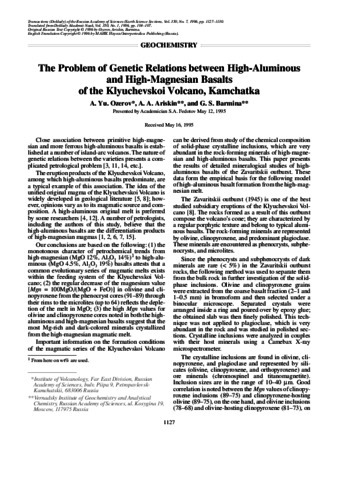 P. 1127-1130. Detailed studies of volcanic tremor envelopes with frequencies ranging from 5.5⋅10-6 to 2.5⋅10-2 Hz (50 hrs - 40 sec), recorded during the Klyuchevskoi volcano eruptions of 1983 and 1984, revealed five major frequencies: 1.1⋅10-2 Hz (T1 = 1 min 34 sec), 2.5⋅10-3 Hz (T2 = 6 min 10 sec), 4.2⋅10-4 Hz (T3 = 40 min), 5.1⋅10-5 Hz (T4 = 5 hrs 30 min), 7.7⋅10-6 Hz (T5 = 36 hrs), as well as superpositions of their harmonics. In the 1993 eruption, fluctuations in the volcanic tremor envelopes have frequencies of TI = 2 hrs 48 min and TII = 6 hrs 12 min, which correspond to periodicities in the dynamics of eruptions identified by visual observations since 1932. The distribution of peak amplitudes has been found to vary in relation to eruption intensity—increasing eruption strength correlates with an increase in the amplitude of low frequency peaks, and vice versa. 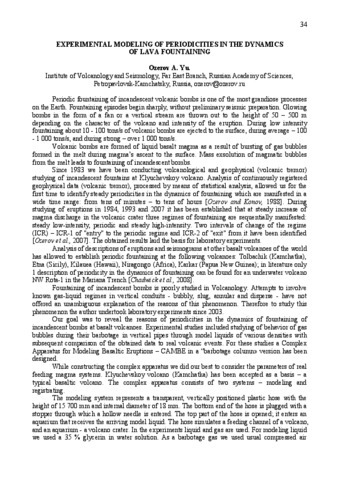 It is concluded that volcanic tremor allows monitoring of eruption dynamics. Possible reasons for the occurrence of periodicities are discussed, but a comprehensive model for this phenomenon has not yet been developed. Ozerov A.Yu., Gordeev E.I., Dvigalo V.N. Modern volcanism of Kamchatka, Russia // Proceeding of the 3-rd International symposium. Jeju Volcanological Institute. Korea. 2005. С. 33-41. Ozerov A.Yu., Karpov G.A., Droznin V.A., Dvigalo V.N., Demyanchuk Yu.V., Ivanov V.V., Belousov A.B., Firstov P.P., Gavrilov V.A., Yaschuk V.V., Okrugina A.I. 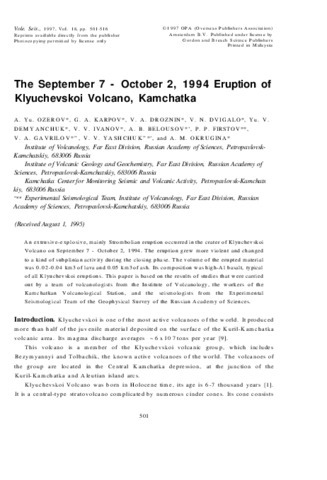 The September 7 - October 2, 1994 Eruption of Klyuchevskoi Volcano, Kamchatka // Volcanology and Seismology. 1997. № 18. P. 501-516.